The price of a carbon permit under Europe’s emissions-trading scheme has dropped 15% in the last two weeks to reach an 8-month low of 20.15 euros. Prices dropped another 5% on Friday alone. 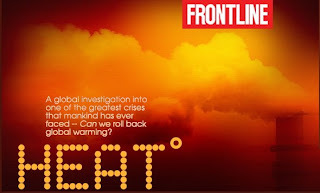 On the eve of a historic election, award-winning producer and correspondent Martin Smith investigates how the world's largest corporations and governments are responding to Earth's looming environmental disaster. . . Smith traveled to 12 countries on four continents to investigate whether major corporations and governments are up to the challenge. HEAT features in-depth interviews with top policy-makers and with leading executives from many of the largest carbon emitters from around the world, including Chinese coal companies, Indian SUV makers and American oil giants. The report paints an ominous portrait. Despite increasing talk about "going green," across the planet, environmental concerns are still taking a back seat to shorter-term economic interests. For many scientists the signs are already apparent - what we saw in the Himalayas, what's happening in the Arctic, the increased strength of storm. And millions more people every year are coming to grips with this. But it's hard to pay attention to melting ice caps, when their 401Ks are melting at an even more rapid rate. In fact, the problem is worse than lack of public attention or even the diversion of capital away from climate to more immediate concerns. A front-page WaPo article on Monday, As Fuel Prices Fall, Will Push For Alternatives Lose Steam? points out that the lower price of energy in a slowing economy removes much of the economic incentive to develop alternate energy technologies. If you missed the program, or if you want to review individual sections, video is available on the show's website. Also available on the site are supplemental interviews and audience responses. A teacher's guide and transcript are scheduled to be posted soon.